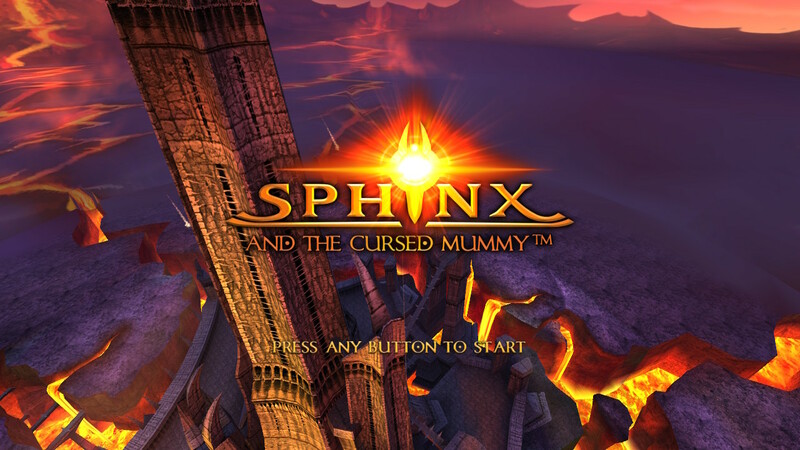 Sphinx and The Cursed Mummy was previously released in 2003 on PlayStation 2, Xbox, GameCube, Windows, Linux, MacOS, and Java to positive reviews, but this sixteen-year remastering of Nordic Games’ early 2000 title is a bit odd to me and begs the question, who asked for this? Let’s look further to see if having a Sphinx and a Mummy as playable characters on the Nintendo Switch is still fun in 2019. The story of the Sphinx and The Cursed Mummy starts off with the Sphinx and his friend Horace looking for the sword of Osiris in hopes to stop the impending doom as the tower overlooking the land is awakening with a deadly ‘eye’ watching over the inhabitants. After a short introduction cut-scene and a bit of reading, you’re tasked with finding the sword and saving the land. Along the way you step into the role of the young Pharaoh Tutankhamun and see the adventure from his point of view, which a short way in, takes a turn for the worse. The story has you swapping between characters and locations, which was a unique gameplay mechanic in 2003, with the story unfolding in small chapters until ultimately coming side by side with our two heroes working together to solve puzzles and defeat enemies as the journey concludes. In Sphinx and the Cursed Mummy, you navigate the chapters by playing as either Sphinx or the Pharaoh. With each character, you are given a set of moves, with the Sphinx being more agile and combat heavy, while the Pharaoh is more stealth-centric in his moves to solve puzzles while navigating through the castle and the Egyptian world. I found many of the platforming sections of the game to be bogged down by slightly floaty jumping and a camera that didn’t always position itself in the best place when trying to land your jump. There are also rope swinging sections which reminded me of old school platforming like the ones found in Tomb Raider games, but without the precision you’d expect for a platformer in 2019. In each of the levels you will find yourself going from point A to point B, though some levels do have a bit more of an ‘open world’ feel to them as you can traverse the palace in your own order for instance, which was a nice change of pace from the more linear sections of the game. Character interactions are limited to spoken dialogue boxes and sometimes there are a lot of them. Conversations with characters can take a long time to read and cycle through and from time to time key information to either the story or the next tasks you need to complete is told through those long-winded interactions. The main issue I had with some of the longer conversations where the sparseness of the save points in the game. After dying and failing a section of the game sometimes due to a wonky camera, I would have to relive a cut-scene again and again. It would have been nice though for the remake to have some sort of way to skip the cut-scenes along with some voice acting. The game features an array of different NPCs, with most of the objectives to complete being “fetch quests”. The quests themselves felt limited in scope mostly because the various areas of the game were more contained and not open-ended. I never felt like the quests themselves were overbearing, although some of them do have a bit of that early 2000’s style charm to them. The writing is at least decent enough to warrant a chuckle occasionally. Much of the dialogue and questing felt like second-rate Banjo-Kazooie or Mario 64 level side-questing. The music in Sphinx and the Cursed Mummy helps to set the stage as it incorporates many Middle Eastern instruments and overtures. The sounds of the game are not necessarily awe-inspiring or immersive to the level of being memorable, but at the same time, they are done well enough to fit with the overall pace and tones within the game. There were some instances of sound effects being slightly off the action and others where they felt repetitive, oftentimes when monsters would spring to life or when you would use your sword-slash attack. One sound in the game that I really liked was the sound of the sarcophagus in the King’s temple as you crack them open and close. Overall, the music and sounds of Sphinx and the Curse Mummy is somewhat underwhelming by present standards, although fitting for its time. It is not orchestral in nature like the music you would find in The Legend of Zelda or Super Mario games of recent times. In my play through, which was mostly docked, I never experienced any bugs or hiccups. The game seemed to run smoothly, and although there were some load times that seemed a bit long for the lower quality design of the game’s models and textures, there weren’t any frame-rate dips and drops that stood out to me during my time in the ancient Egyptian world. Sphinx and the Cursed Mummy is one of those games that I still wonder, who was clamoring for this game and desiring an HD remake? It’s not a terrible game, but it hasn’t aged well. For a 3D platforming game to succeed it needs to have a decent amount of exploration and platforming that is fun and exciting, as well as an acceptable camera so that jumping from platform to platform isn’t inhibited by awkward viewing angles. If you’re looking for a platforming game on the Switch there are other better games out there. But if you have a bit of nostalgia for the game you may want to revisit the Sphinx and the Cursed Mummy.